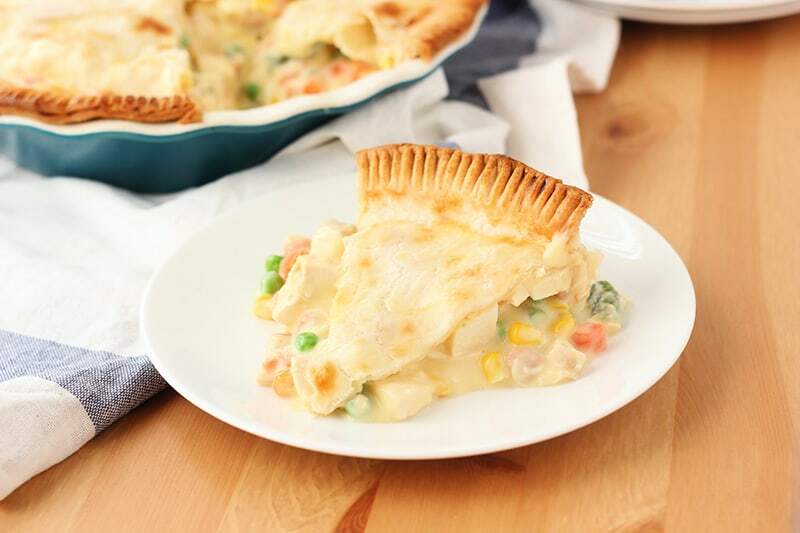 A delicious semi-homemade chicken pot pie recipe made with frozen vegetables and cream of chicken soup for a comfort food classic. We had some leftover rotisserie chicken from a previous night and I was so excited to whip up a pot pie. It is the ultimate winter comfort food for me. 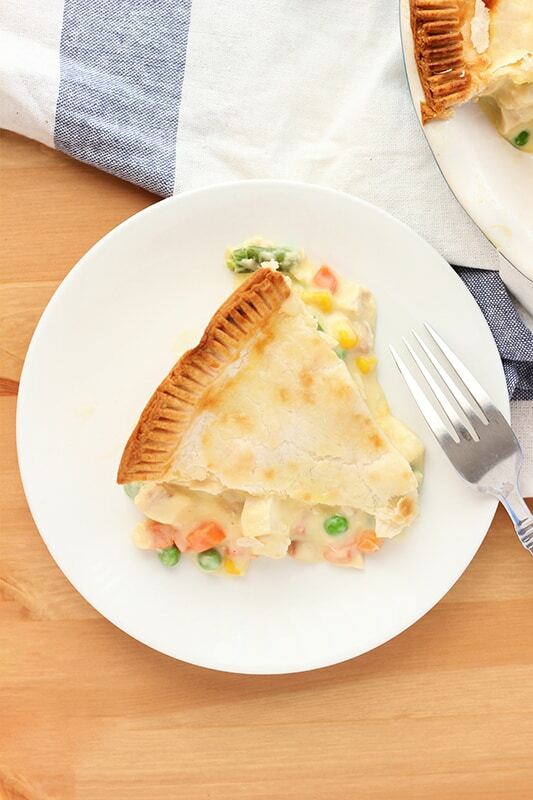 So creamy and delicious with the mixed veggies and beautiful flaky crust. The only problem was that the chicken broth, I was so sure I had, was missing from action. I had a whopping 1/4 cup left in the refrigerator which is not nearly enough for my go-to recipe. I was not really sure how I could salvage my dinner idea, but decided it might be smart to substitute a can of cream of chicken soup into the filling. This recipe has it all. It is incredibly simple to whip up, freezer friendly, and delicious! Do not be afraid to mix things up. We used frozen veggie mix but you could easily substitute fresh vegetables. Try broccoli or even green beans! This is a great freezer meal! Before you get to the baking part of the recipe, wrap your pot pie in plastic wrap, stick in a zip top bag, and freeze. Mix and match your spices. I am a sucker for thyme. That being said, we have also tried an Italian spice blend and rosemary in this dish with wonderful results. Like this recipe? You will love my Chicken Pot Pie Soup, Oven Roasted Chicken Breast, Easy Baked Ranch Chicken! 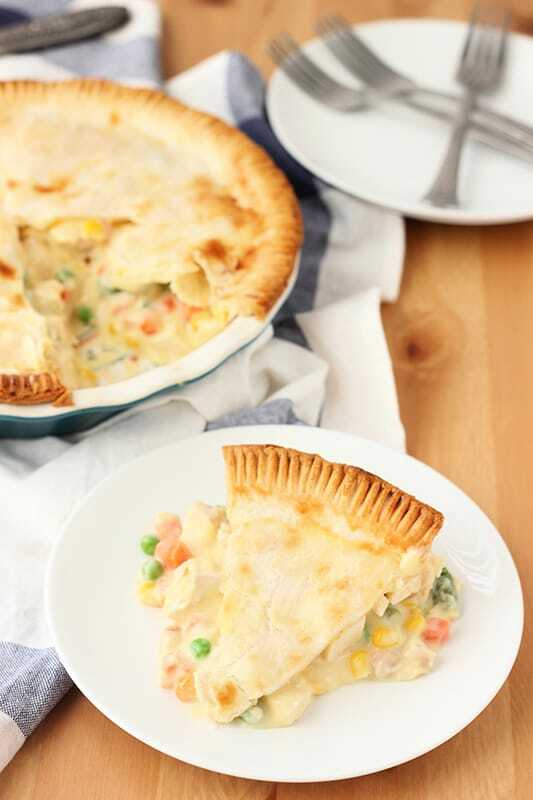 A delicious semi-homemade chicken pot pie recipe made with frown vegetables and cream of chicken soup for a comfort food classic. Preheat your oven to 400 degrees. Unroll one of your pie crusts into a 9" deep pie dish. Set aside. Combine your chicken, cream of chicken soup, cihicken broth, frozen vegetables, and seasonings in a large bowl. Mix well and transfer to your prepared pie crust. Gently lay the second crust on top of your pot pie. Trim and crimp the edges and cut three slits in the top with a knife to allow steam to escape.